Buy our mailing list of Italian contacts to reach out to locals in one of the most historical, beautiful, and economically viable parts of Europe. Form real B2B relationships with the help of our accurate Italy email list, which is ready for you to download right now. It's time to reach out to an influential market that's important to so many different industries and the rest of the world: Italy. But to cross the Alps or the Mediterranean Sea and reach into this community of professionals, you need good sales leads. We've done all of the fishing for leads and generated numerous potential points of contact, pulling them into one bulk email list of Italian professionals, which can be sorted and managed as a .CSV file by your sales team whenever they need to conduct a local campaign. Whether you're flaunting a fashion product in Milan or a software service in Rome, having accurate contact data can be the most important factor in making the sale. 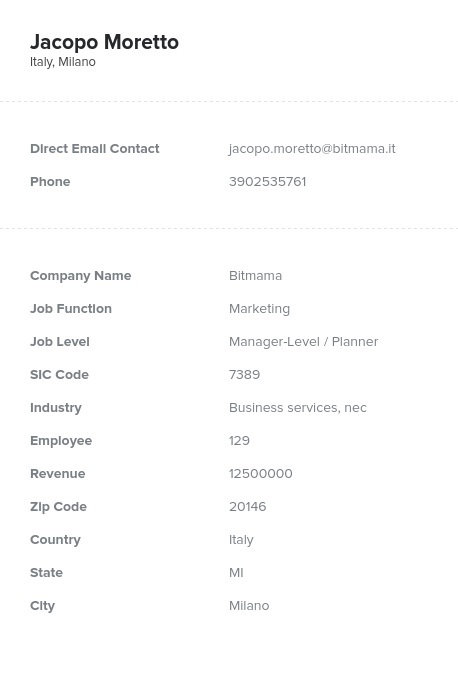 Our Italy email database happens to be human-verified and full of the quality information your sales team could use to network: Italian emails, addresses, numbers, real names, job titles, and more! This is one of our many localized business mailing lists pulled by country. Note that you can also further narrow your audience to build a custom, targeted email list based the needs of your specific campaign. Use our list-builder tool to try it, or buy the email leads in this pre-built Italian marketing list and get a resource that can be used for multiple purposes in minutes!